This stylish bracelet will capture anyone's heart! 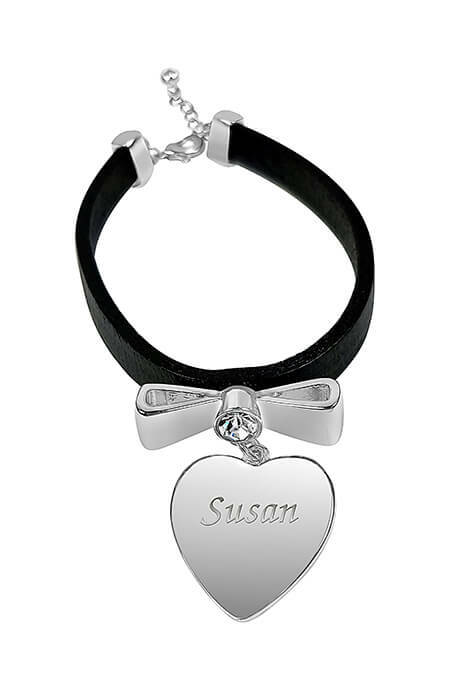 Simply chic black leather band features a silverplated heart charm dangling from a classic silvertone bow with a Czech crystal in the center. Heart can be personalized, making it the perfect gift for yourself or someone you love. Specify name: 1 line, up to 9 letters/spaces, upper/lower case. 8 1/2" long bracelet features a lobster clasp and 1" long extender. Silverplated-zinc 7/8" wide heart charm and 1 1/8" long bow resist tarnishing. Allow 4–6 weeks for delivery.